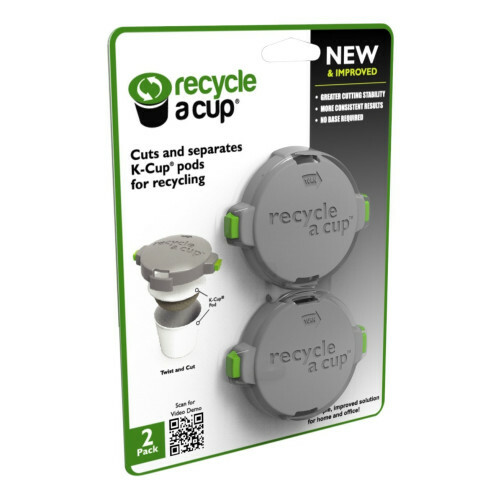 New & Improved Recycle A Cup cutter separates your used K-Cups so they can be totally recyclable. Did you know that K-Cups are not recyclable? Did you know that nearly 20 billion K-Cups will be consumed this year - enough to circle the globe 12 times - and that most of them will wind up in our landfills? 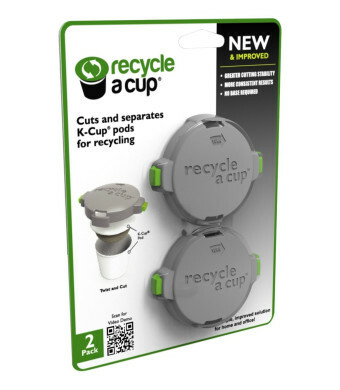 There hasn't been a solution to this problem until now: Introducing the Recycle A Cup - an innovative handheld device that allows you to separate your used K-Cups so they can be totally recyclable! Simply load the pod into our unique Recycle A Cup, press the green buttons and twist once completely around the pod. Use the grinds as compost and recycle the rest, it's just that simple. Now you can enjoy your coffee every day knowing that you're doing your part to make the world a cleaner place. For more complete information regarding Recycle A Cup, visit our website at recycleacup.com.